Is Acupuncture a Cure for Smoking? Acupuncture is an age old traditional Chinese therapy, which involves the accurate placement of fine needles on specific points of the body to achieve a therapeutic goal. Often viewed as a sham by most western practitioners, acupuncture is slowly making its way into the arsenal of anti-smoking groups. Its use to combat nicotine dependence in the West began by chance after observers in Hong Kong noted that opium smokers receiving acupuncture for pain relief began experiencing less severe withdrawal symptoms than expected. This led to a wave of experimentation by acupuncture practitioners with the sole aim of helping smokers quit their dependence on nicotine 2 techniques have been developed: Needles are inserted during an acupuncture session, and left for the entire session, often lasting 20 minutes. This is done on a specified quit date and repeated several days later when the withdrawal symptoms become noticeable. Indwelling needles or beads are fixed onto pressure points in the ear lobe (attached with surgical tape) and the participant is then asked to press these attachments intermittently or during periods when the crave for nicotine needs to be suppressed. A lot of different techniques have stemmed from these two- some involving electrical currents through the needles, while others remove the need for needles altogether and rely on electrical stimulation through electrodes. These advances in “electro-acupuncture” have vague similarities to some therapies (Cranial electro stimulation) used to treat insomnia, anxiety and depression in East Europe. Considering the addictive nature of nicotine, it might not be that farfetched to acknowledge that electro-acupuncture could have a role in keeping nicotine dependence at bay. Early studies on the effects of acupuncture have reported encouraging success. In 1982, a study by Fuller boasted a success rate of 95% in the first few months, and in 1983, another study by Choy reported an 88% success rate. However, subsequent studies have revealed inconsistent findings, and various reports have attempted to critique the efficacy of acupuncture based on different research data. The current conclusion is that there is no consistent evidence showing that active acupuncture techniques have an effect on quitting smoking. This does not mean that acupuncture is useless, but that the studies to date contain various flaws that make it difficult to draw a definite conclusion. Acupuncture shows a positive outcome in the hands of experienced users and it is definitely better than stopping cold turkey. Smoking cigarettes extensively can cause addiction. This dependency is caused by nicotine. Nicotine is a habit-forming ingredient residing in the leaves of tobacco plants and is responsible for about four percent of the plant’s weight. After processing, the leaves hold about seven to twenty milligrams of nicotine per cig. The average smoker takes in one milligram of nicotine per stick. It is this inhaled nicotine that forms the need and desire. The best question to ask is: “How do I start quitting smoking?” It can’t be argued that it is hard to stop smoking. It takes a lot of commitment to prevent you from smoking that next cigarette. It is challenging enough to have to come up with an enormous amount of strength to prevent you from smoking non-stop. You will inevitably experience withdrawal symptoms like anxiety attacks, nicotine cravings, irritation, as well as an inability to concentrate, just to name a few. But due to modern science breakthroughs, there are now countless differing ways to stop the habit. Why Should You Break Smoking? Cigs might make people look classy and cool, but people need to take into consideration the more important things – health effects – rather than how it makes you look. It is important to know that cig smoking may become addictive before you even complete your first cig. After all, starting is extremely simple; dropping the need is the most difficult aspect. 1. Medicine: There are different medicines which physicians prescribe to assist addicts in their journey to end their addiction. These consist of either relaxants or sedatives which help calm and control your nerves. These medicines aid in alleviating the discomfort caused by withdrawal symptoms. 2. Hypnotherapy: This is considered a moderately effective way to rid of the smoking habit. The willing addicts agree to partake in a hypnosis session. During the session, the therapist will conduct the method of auto-suggestion to give the addicts the will power they need to quit cigarettes. 3. Will power: It requires adamant will to execute intents of giving up cigs. Will power is nothing but a state of mind, a mindset that is very troublesome to achieve. People who have highly weak will power will come across several troubles when wanting to give up cigs. Just keep in mind that if you put your heart and soul into your goal, you will accomplish it. It also is beneficial to have yourself surrounded by supportive family and friends to aid you in your journey to quit. 4. Seek counselling: Nonetheless, the best of will power fails at some point in time. It is during these occurrences that you need to find professional help to support you on your goal. Counselling is very important for behavioural assistance. Counsellors help hike up your morale and get you back on track to stopping cigarettes. 5. Smoking aids: Smoking aids do nothing less than release little quantities of nicotine into your body. Aids are great for calming your body’s nicotine addiction, without the harmful tar and carcinogens found in cigarettes. Because aids still have nicotine, it is a good idea to use aids in conjunction with an aid that eases you off your nicotine addiction. Does Acupuncture Quit Smoking Really Work? Can It Help You To Quit Smoking? I believe that the answer is yes, it can help you to quit, but it will probably not carry you through the entire process. This means that you will want to combine this technique with other methods of quitting in order to be insuring your success. The procedure is actually fairly cheap (compared to smoking) and it should be fairly cheap compared to other quit smoking aids. If you figure out the true cost of the gum or the patch and total up all of the money you would spend on them, then usually acupuncture is pretty inexpensive in comparison. Of course, if you total up the cost of your smoking over the next, say, 10 years, then the cost of acupuncture is essentially free, as it will pay for itself in less than a month for most people (provided they actually stay quit). You have to realize that getting this procedure done will not actually give you motivation to quit smoking. You have to generate that on your own. It can only help you. It cannot cure you. People who are seeking motivation through quit smoking aids are actually looking for a cure that does not exist. Understand the difference here and you could save yourself a lot of time and money. Only do this if you really want to quit smoking, not if you just wish that you were a non smoker. Everyone moans and groans about this because people are lazy and they do not want to put forth such a large effort. If you really want to quit smoking then you are going to need the boost in endorphins that comes from daily exercise. Without this you are not going to have a way to replace the “feel-good” chemicals that you used to get from cigarettes. 2) Stay awake for 36 hours after smoking your final cigarette. This is an excellent tip that will carry you through the worst of your withdrawals. How? Because if you stay up for 36 hours after your final smoke, then you will sleep long and hard through the worst portion of your withdrawal from nicotine. It is the perfect strategy to get you through the toughest part of your quit. Should You Try Acupuncture To Stop Smoking? Absolutely, it’s worth trying. It is a decent secondary strategy that can help assist you in quitting smoking. If you do have the procedure done, you will notice that your craving to smoke will have decreased after the procedure. As such, you might have a couple of sessions before you are really ready to stop smoking. There is no reason to be nervous about the needles. It does not really hurt much, if at all and pretty much nobody complains about pain from the needles. It is a very clean and clinical thing, not messy or scary at all. Now if you plan to quit smoking with acupuncture, you should actually go far beyond just having this as your basic plan and come up with some other strategies to help you to quit smoking. Acupuncture can certainly help but it will probably not do the entire trick on its own. In order to be successful at quitting, this will just need to be one part of your overall strategy. Does that mean that you should not even use this method? No, it is still worth being part of an overall quitting plan. But you need more in order to insure that you are successful at staying stopped. What are some strategies that can go along with acupuncture? The main one is exercise. You should be exercising every single day, and if you are not, then you should start. It should be the type of exercise where it is somewhat vigorous and you are working up a sweat. This can be a brisk walk if you like, or just about anything else, as long as you get your heart pumping and get your endorphins going. You should aim for 30 minutes per day of vigorous exercise. If you do this, it will be a huge addition to your acupuncture, and might even be a more important part of the equation. It will help you tremendously. Another strategy that you might try is to get some chewing sticks for your mouth and some Bic pens for your hands. The chewing sticks are like fancy toothpicks that you can get at the health food store, and they usually have tea tree oil in them and are flavoured. The Bic pens you can keep in your hand and push the clicker button all day long so that your hand has something to do when it wants to hold a cigarette. These strategies might sound silly, but you will not think so when you are going through nicotine withdrawal! Quit smoking with Laser Acupuncture? Twenty years ago that would have sounded even stranger than it does today, but you’ll probably be hearing the term more often. As more and more Americans look for cessation methods, being able to laser acupuncture for smoking cessation is sure to draw some attention. But if your intent is to stop smoking with laser acupuncture, what are you getting yourself into? Well, it’s just another way of saying you’re going to quit smoking with laser treatments, or cold lasers, or low level lasers. Acupuncture is an ancient technique derived from traditional Chinese medicine that uses tiny needles to stimulate special points on the patient’s body; for smokers, the goal is to help reduce cravings and ease withdrawal symptoms throughout the body. Needle placement varies for each individual and to a lesser extent for each acupuncturist, but common placement points include the ears, feet, and top of the head. After an evaluation that may include reading the patient’s pulse and possibly other vitals, the acupuncturist determines a smoker’s physical weaknesses and uses the needles to address them accordingly. Acupuncture is the most extensively studied among the alternative, or complimentary, therapies used to quit smoking, but the research is mixed on regular acupuncture just as it is on laser treatments. And like laser smoking acupressure, it is generally considered a reasonable option for smoking cessation because there is very low risk. If you are a smoker and you have literally tried everything to quit, yet can’t seem to kick the habit for good, you may want to try acupuncture. Acupuncture is the ancient Chinese practice of using tiny needles at certain pressure points in the skin to treat certain diseases and disorders. It is the belief that by using the needles at certain points in the body, it may be possible to cause the person to stop smoking. For this reason, more and more people each year are making appointments with acupuncture specialists with the hope of quitting this disgusting, and expensive, habit once and for all. How Does Acupuncture Help With Stopping Smoking? The technique of using acupuncture to help stop smoking is by inserting the thin needles into the skin over certain organs designated as affecting the breathing areas of the body, such as the lungs, the airways and the mouth. This stimulates the organs, and the areas of the body controlled by them, to help the person stop smoking. By having acupuncture performed to stop smoking, smokers have reported a diminished need to smoke and have even shown that the cigarette related chemicals have become absent, or lessened, in their bloodstream. There are many specialists who practice this ancient Chinese art of acupuncture and more acupuncture clinics are opening up every year, in every city around the world. When you schedule an appointment with an acupuncturist with the hopes of quitting smoking, the practitioner will sit down with you and will ask you certain questions such as how long you’ve smoked, how much you smoke and your reasons for quitting smoking. They will also more than likely ask you if you are using any other smoking cessation products, such as the patch or the gum, as these may negatively affect the results of the acupuncture treatment for stopping smoking. Many people try every year to quit smoking using the patch, the gum, hypnosis and anything else they can get their hands on. Yet these same people end up picking the habit back up soon after stopping the program. It doesn’t say anything negatively about them, it’s not their willpower and it’s not a judge of the worthiness of a person. It simply means that smoking is one of the hardest habits to break. 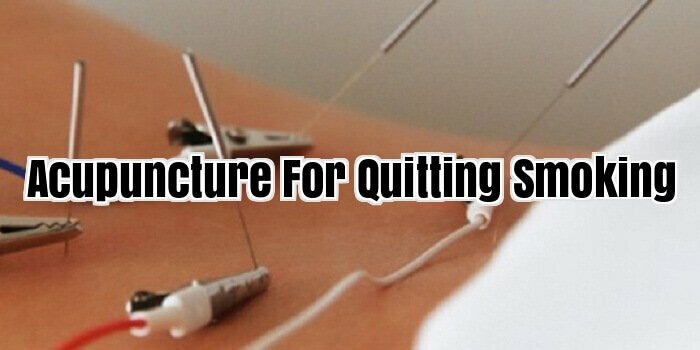 For this reason, if you’ve never tried acupuncture to stop smoking before, maybe you should give it a try. It just might be what you’re looking for to save yourself from this horrible habit for good.